Electric motors are the beating heart of any electric vehicle, and thanks to a startup in Belgium, your next EV’s motor could be stronger, smaller and more efficient. 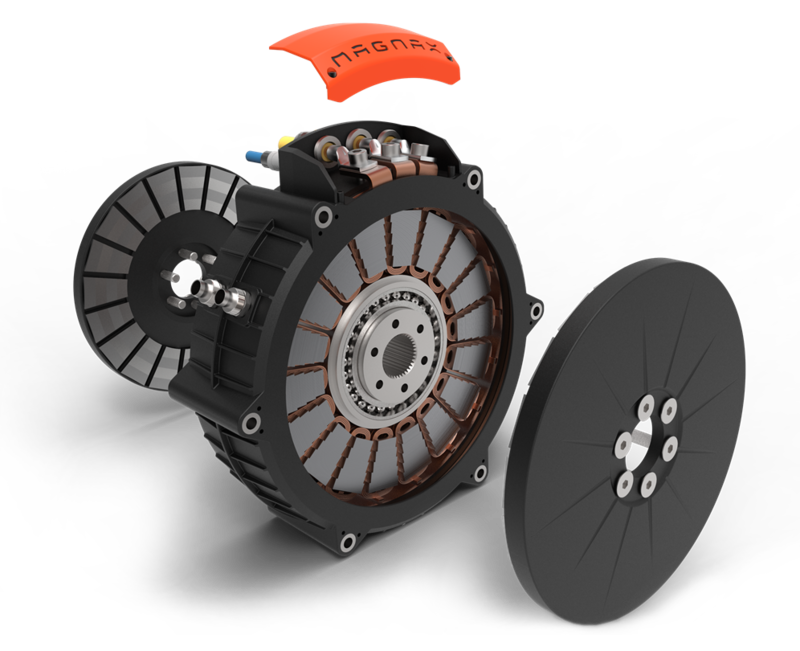 Magnax is hard at work developing new axial flux motors for use in EVs and other applications that require powerful yet lightweight motors. This could mean faster, lighter and generally more awesome electric cars and motorcycles, among other new developments. Axial flux motors are a major improvement over standard radial flux motors, which leave a significant amount of copper overhanging on the ends of the coils. In radial flux motors, any copper not perpendicular to the magnet’s rotation is essentially wasted. Axial flux motors, on the other hand, offer the lowest possible copper loss. This translates to higher efficiency. In other words, more of the battery power gets turned into useful motor power. These axial flux motors are also more efficient due to their intrinsically enhanced cooling. Because the coils can be pressed directly against the exterior motor case, they can cool much faster than in radial flux motors, which must transfer the coil heat through the stator of the motor. Magnax has a few other innovations that they are working into their motors as well. Instead of standard round wire for their copper coils, Magnax is using rectangular cross-section wire to pack more copper into the same space, resulting in a copper fill of up to 90%. They also employ a yokeless stator, which provides the shortest possible flux path, as well as using grain-oriented steel, which they claim can reduce the core losses by as much as 85%. Ok, that sounds nice and all, but what are these fancy tech specs good for? What this all adds up to is a motor that can be insanely light compared to the amount of power it produces. Magnax claims their axial flux motors can reach up to 15 kW/kg peak, or 7.5 kW/kg nominal (9 hp/lb peak, or 4.5 hp/lb nominal). But power means nothing if you can’t keep the motor cool. With the improved cooling capacity of axial flux motors, Magnax’s new motors will be able to provide higher power for longer, resulting in better performing vehicles. This is our way of contributing to a sound environment for our children. Magnax enables industrial innovation with axial flux motor and generator technology that outperforms in efficiency, weight, reliability, and cost-effectiveness. Magnax supports the global transition to fully renewable power generation, electric transportation and ultra-efficient machines by innovating in next-generation electric motor and generator technology. Magnax is already preparing to debut their first prototype motors by the end of this year, with a stated goal of an unveiling in October. The prototype motor will be a 275 mm (10.8 inch) diameter motor weighing 22.5 kg (50 lb) and capable of between 300 to 408 kW (400-550 hp) of power. They are also developing a smaller 7 kg (15.4 lb) version of the same motor with a diameter of 185 mm (7.2 inches) and peak power output of 84 kW (113 hp). The company is envisioning the use of these motors in everything from electric motorcycles and vehicles to electric aircraft, and even in large wind turbines when used as generators.